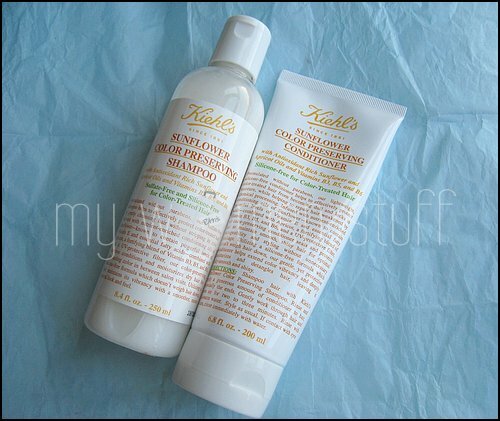 Home » Hair » Does Kiehl’s Sunflower Color Preserving Shampoo and Conditioner come up Peaches? Does Kiehl’s Sunflower Color Preserving Shampoo and Conditioner come up Peaches? When I got my hair coloured, I also found myself in the uneviable position of having to buy shampoo for coloured hair. I don’t need more bottles of shampoo clogging up my shower stall! But for the sake of maintaining my hair colour for longer, I decided to. I opted to try something new by Kiehl’s – their Sunflower Colour Preserving Shampoo and Conditioner. I popped into the store at Pavilion to pick up a sample but they were out, so I bit the bullet and bought a set for about RM145 – yeouch! 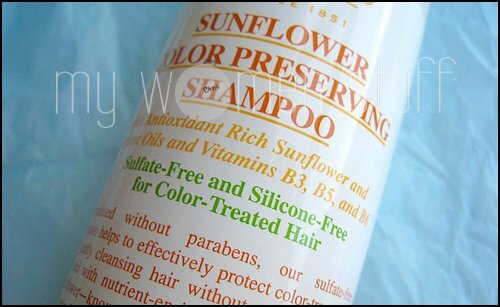 The Kiehl’s Sunflower Colour Preserving Shampoo line is paraben, silicone and sulfate free. Knowing that, I did not expect the shampoo to lather up and truly, it does not. Its a weird feeling because I find myself using a little more than I usually do to get some sort of lather going. When I rinse out the shampoo, my scalp feels clean, and my hair does not feel dry. But it does not feel quite as clean as I expect it to. There’s one fly in the ointment. After about 2 weeks of using this line of hair care, I’m wondering if my hair is not feeling heavier than usual. My sister commented that my hair was looking a little flatter than usual which is not a compliment. I tried stopping this shampoo and conditioner for a few days and my hair does feel a little lighter so, I’m looking twice at the Kiehl’s Sunflower Color Preserving line the next time I step into the shower. I’ll still use it up – peaches are too good to resist! 😀 But I would likely not repurchase. Kiehl’s Sunflower Shampoo is RM75 and the Conditioner is RM70. Have you tried this line from Kiehl’s? Do you have shampoo and conditioner to recommend for coloured hair? PREVIOUS POST: Peter Alexander sleepwear are too pretty for the bedroom! I switched to the Paul Penders shampoo / conditioner and my hair wasn’t dry anymore, plus i found that my scalp felt a lot cleaner and i didn’t absolutely feel like a grease farm the day after washing (washing hair too often dries it out and is bad for roots). They’ve changed formulations a few times since the first one i tried (which i still like best i think), the last formulation was ok, still using it up, can’t wait to finish it up so I can try the newest formulation. I love the Shielo Color Protect – both shampoo and conditioner – but it’s usually way too expensive in the salon. Love that I can get a great price on it AND have free shipping ordering at their website online. Best shampoo I have used to preserve my color job. I highly recommend it if you spent alot of money coloring your hair, and now want to keep that color as long as possible!